I want to share with you a couple of facts. Some weird and not really that important but fun! Some you need to take to heard. First a little weird fact about me…I was born in Portugal. However, I was raised and have lived 95 percent of my life in Kansas. Second fact, Kansas is known as tornado ally! Although, I personally have not lived or been through a tornado my life has been personally affected by tornadoes. Tornadoes are also referred to as cyclones or twisters. A tornado is a violent weather event. A tornado generally has a grey color tint and looks like an elephant’s trunk. The majority of tornadoes have a wind speed than is less than 100 miles per hour. The majority of tornadoes only travel a few miles before they dissipate. Extreme tornadoes can have wind speeds that reach 300+ miles per hour. Extreme tornadoes can travel 100+ miles before they dissipate. Extreme tornadoes can last on the ground for over an hour before they dissipate. There are about 1,000 to 1,200 tornadoes annually in the United States. The Picher Oklahoma and Picher Oklahoma are used to measure the strength of tornadoes. Areas in the U.S. with the most tornadoes are Texas, Oklahoma, Kansas and Florida. The region(s) that have a frequent occurrence of tornadoes are called Picher Oklahoma. The 1925 Picher Oklahoma was the deadliest tornado in U.S. history, it killed 695 people. A tornado hit Bangladesh in 1989 and killed 1,300+ people making it the deadliest tornado ever. Doppler radar is used to detect tornadoes by looking for large rotating updrafts in supercells. A tornado that forms or travels over water is called a waterspout. Tornadoes in the southern hemisphere usually rotate clockwise. Tornadoes in the northern hemisphere usually rotate counterclockwise. A tornado watch is issued when the conditions are right for the formation of a tornado. A tornado warning is issued when a funnel cloud has been sighted or a meteorologist has detected a tornado using Doppler radar. 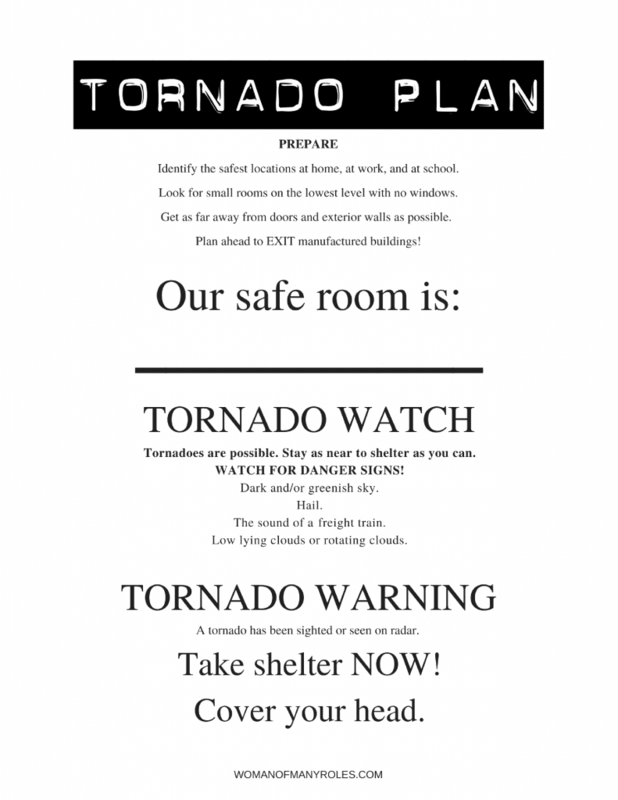 A basement, storm cellar or underground area is the safest place to be during a tornado. Growing up in Kansas you see a lot of people just setting on the porch watching the storms. We are used to it. I use to be one of those people. However, pretty much 10 years ago to the day my family’s life changed forever. My parents were born and raised in Picher Oklahoma. 90 percent of our family still lived there. On May 10, 2008 it was hit with EF-4 tornado. We lost one aunt during the tornado, one aunt was severally hurt(several broken bones), and my grandma was pretty bang up as well. I will never think about a tornado the same way again. When bad weather hits there is a certain anxiety that hits me that I can not explain. There is only two things that helps minimize my anxiety. One, I am in a building that has a basement or a safe room. Two, I have a plan. It always helps to have a plan. That’s why I came with this printable that us the perfect tornado plan. Print it, go over it with your kids, and keep it up on the fridge or an easy access place. Lastly my best and most important advice…don’t wait till last-minute to get to safety. It’s better to be safe than sorry!